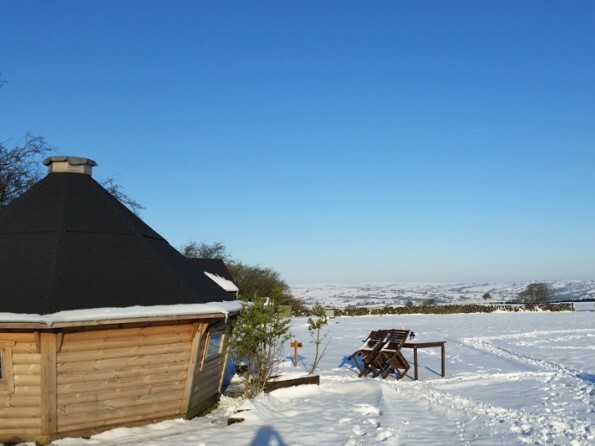 On the edge of the Peak District National Park, with stunning views across the Staffordshire Moorlands, is a small collection of quirky holiday rentals, home to cosy Bilberry Lodge. If you`re looking for an outdoor adventure without having to sacrifice luxury, romance and home comforts then you`ve come to the right place. 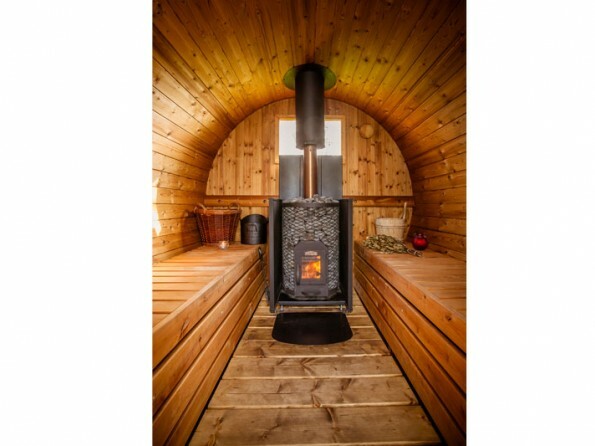 Bilberry Lodge is a Scandinavian-inspired wooden cabin built from sustainable wood sources right here in nearby Derbyshire. 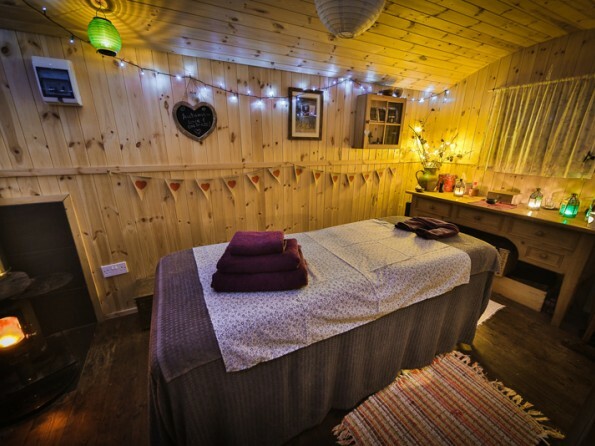 Lovingly furnished yet charmingly simple, the lodge offers everything you could want for a romantic getaway - from crisp bedding and a roaring log burner to handmade toiletries and a delicious local breakfast hamper on arrival...... not to mention the log fired barrel sauna and the wood-fired hot tub where you can relax under the stars. Drift into a world free from the distractions of television, laptops and computer games and instead spend quality time with someone you love. Within 5 minutes of the site thrill seekers will find Alton Towers theme park, wildlife lovers can enjoy Blackbrook Zoological Park, and explorers can cycle through the beautiful Manifold Valley or walk through the conservation projects at Ipstones Edge. A little further afield you can discover the spectacular landscape of the Peak District, visit Chatsworth House and its 1,000 acre park, head underground at the world-famous Blue John Cavern, try water sports at Carsington Water, or wander round the National Trust properties of Ilam Park and Kedleston Hall. 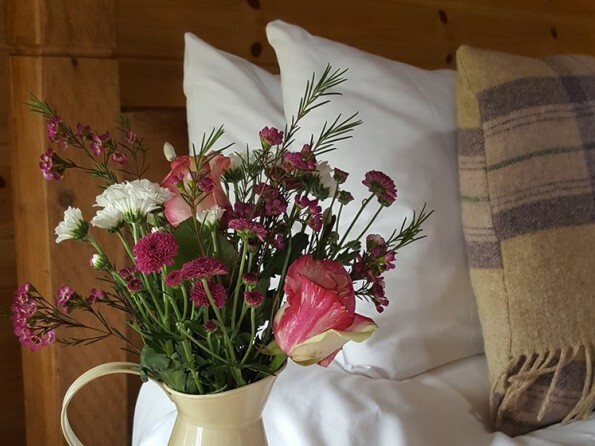 Alternatively you could try your hand at clay pigeon shooting, archery and fly fishing at Yeaveley Estate, take a ride on the Churnet Valley Railway, or visit some local markets and independent shops. Staffordshire offers a world of possibilities. 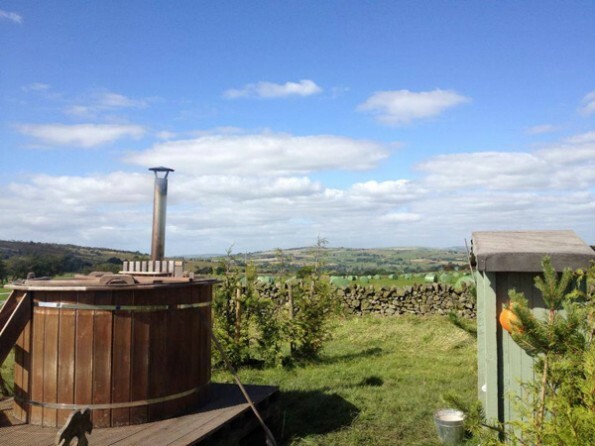 The site is situated between the historic market towns of Ashbourne (7 miles) and Leek (8 miles) on the edge of the Peak District National Park and Staffordshire Moorlands. We are just over an hour’s drive from Sheffield, Nottingham, Manchester and Birmingham. If you prefer to travel by public transport, the nearest train stations are Stoke on Trent or Derby, both of which are less than an hour and a half from London. 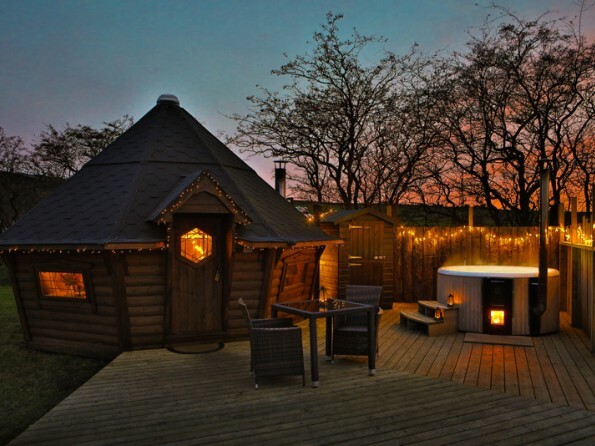 East Midlands Airport is 45 minutes away and Manchester International is 1 hour from the lodge. 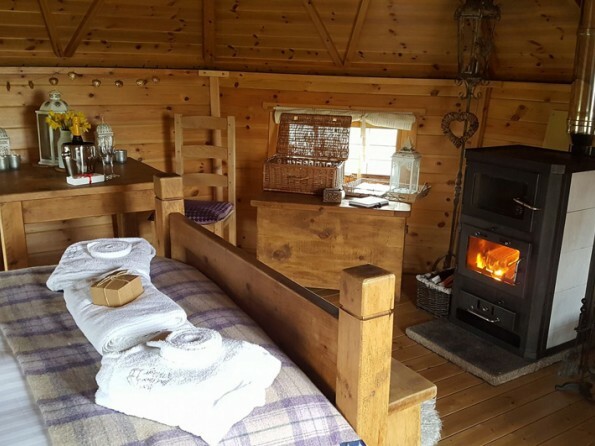 The cabin has a rustic dining table, a cosy double bed with feather down duvets and luxury cotton bedding, and a log burning range cooker to keep you warm, to cook meals on and to radiate an atmospheric glow. 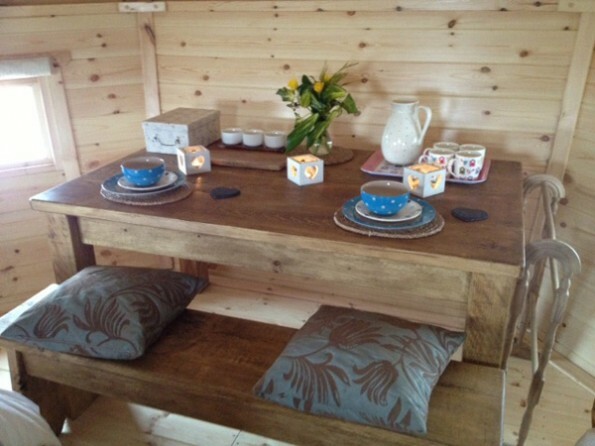 It also has a private composting toilet and towels, cookware and crockery are provided. 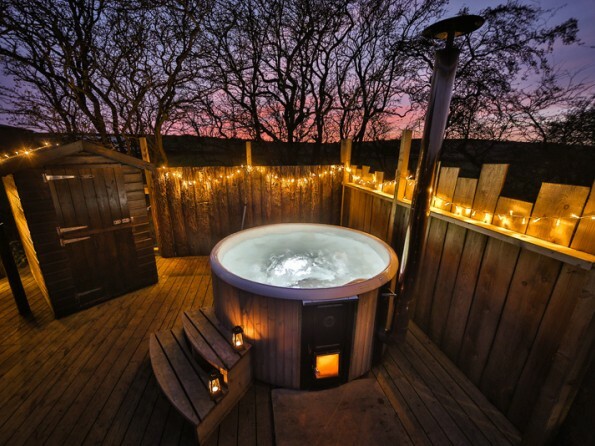 The hot tub is just a short hop from the lodge and a luxurious washroom and log fired barrel sauna are also a stone’s throw away. We believe that energy is precious so our washroom has been designed to utilise natural resources. Made from sustainably sourced timber and insulated with sheep’s wool, a photo voltaic panel provides lighting and water is heated by a solar thermal panel. 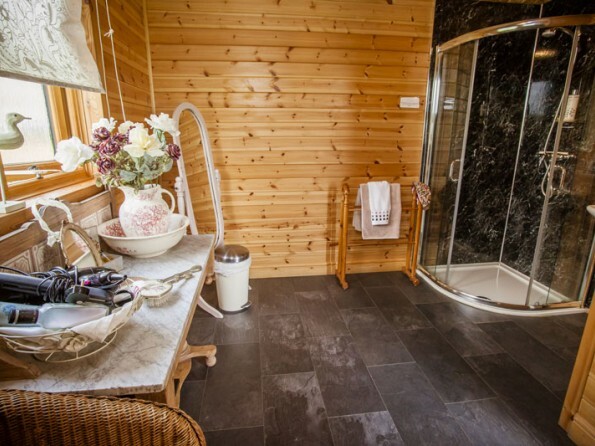 There are two spacious washrooms, each with a shower, sink, full length mirror and dressing area. 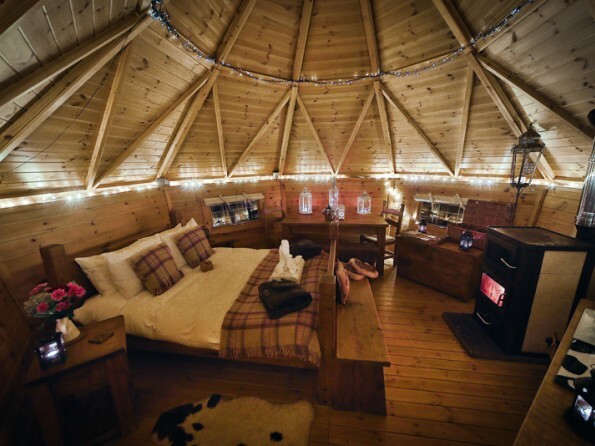 In addition to Bilberry Lodge there are 3 traditional yurts on site, each of which sleeps 2 (plus 2). 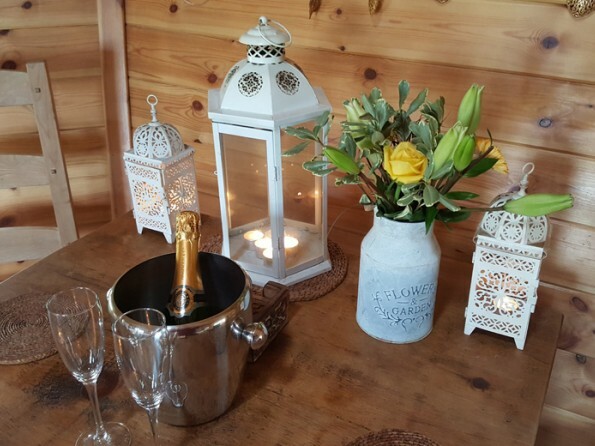 It is possible to book the whole site exclusively and if you do that, Bilberry Lodge will be used as a communal dining area, rather than accommodation. With enough crockery and glasses for up to 20 people this is a great space for entertaining and is extremely popular for family reunions, hen parties and gatherings. During December the lodge will have a real Christmas tree and complimentary homemade mince pies will await your arrival. Please note that Bilberry Lodge is closed from October - February.